JERUSALEM (AP) — Palestinian President Mahmoud Abbas has been sidelined, isolated and humiliated by the Trump administration. But the embattled Palestinian leader may have the final say in determining the fate of the White House’s long-awaited vision for Mideast peace. In recent weeks, Abbas has thwarted a series of internationally backed initiatives aimed at rehabilitating the Hamas-ruled Gaza Strip. With Gaza expected to be the centerpiece of the U.S. peace plan, Abbas has given himself a virtual veto over the expected American initiative. The deadlock over Gaza appears to be a key reason behind the repeated delays in unveiling the plan. For all of its talk about bringing a new approach to Middle East diplomacy, the Trump White House is running into a familiar obstacle that has confounded its predecessors and the international community for over a decade: the Hamas militant group’s continued control over Gaza. The American refusal to work with Hamas, which it brands a terrorist group, and its inability to oust it, has made it virtually impossible to move forward on the diplomatic front — a weakness that Abbas now appears to be exploiting. Abbas has two main concerns. First, he fears that any interim cease-fire deal in Gaza will deepen Hamas’ control over the territory. Second, after Trump’s recognition of Jerusalem as Israel’s capital and his attacks on the U.N. agency for Palestinian refugees, Abbas fears the U.S. is trying to remove sensitive issues from the negotiating agenda. For him, Gaza is the last obstacle preventing the U.S. from forcing what he sees as an unacceptable plan on him. “What is left for this administration to give to the Palestinian people? Humanitarian solutions?” Abbas said in an address to the U.N. General Assembly last week. Hamas, a militant group that opposes Israel’s existence, seized control of Gaza from Abbas’ forces in 2007. Despite three wars with Israel, an Israeli-Egyptian blockade that has devastated the economy and international isolation, Hamas remains firmly in control. Abbas says there can be no progress on the diplomatic front until he regains control of Gaza. 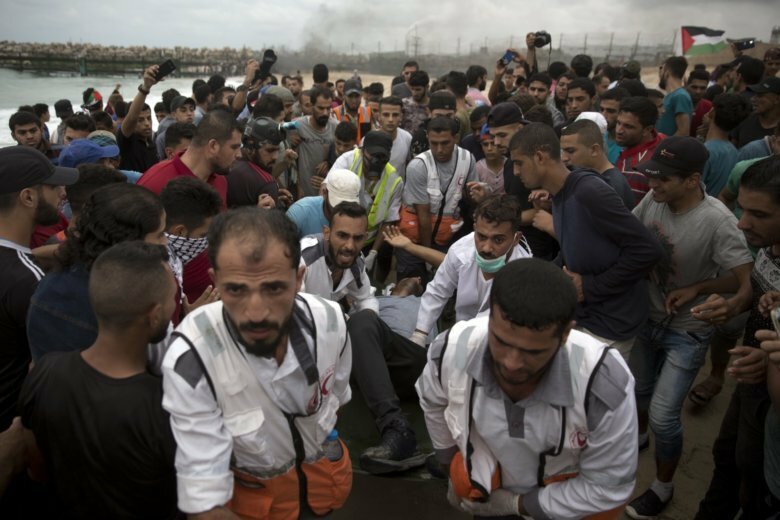 Attempts to reconcile with Hamas have repeatedly failed, leaving the Palestinians divided between rival governments in the West Bank and Gaza. Abbas seeks an independent Palestinian state in the West Bank, Gaza Strip and east Jerusalem — areas captured by Israel in the 1967 Mideast war. The two-state solution has widespread international support. But since taking office, President Donald Trump’s Mideast team, led by his son-in-law and senior adviser Jared Kushner, has backed away from the two-state solution. Although the Trump team has refused to reveal details of its plan, the Palestinians fear the U.S. is plotting to impose a “mini state” that would consist of Gaza and only small pieces of the West Bank. Two senior Palestinian officials confirmed that Abbas has been working behind the scenes to scuttle U.N. and Egyptian attempts to forge a cease-fire between Israel and Hamas or to carry out large infrastructure projects that would bring relief to Gaza’s beleaguered population. As the officially recognized Palestinian representative, Abbas’ government continues to coordinate the movement of goods through Israeli-controlled crossings into Gaza. This has given him the ability to block large-scale projects, even when approved by Israel. Israel, which has come under fierce international criticism over Gaza’s dire state, has in recent days seized on Abbas’ moves, perhaps to deflect attention from its own policies. The Palestinian officials also said Abbas has relayed messages to the U.S. through his Arab allies, Saudi Arabia, Jordan and Egypt, that there can be no peace plan that excludes him from Gaza. The officials, speaking on condition of anonymity because they were discussing internal Palestinian deliberations, said Abbas fears various plans under consideration will end up entrenching Hamas and freezing him out of Gaza. Abbas believes there can be no significant progress in Gaza without a reconciliation deal that brings him back to power in the territory. The talks have repeatedly broken down over Hamas’ refusal to disarm. This week, another set of Egyptian-brokered talks ended inconclusively, according to people close to the talks. “Until yesterday, we did not reach any result worth mentioning,” said Mahmoud Zahar, a senior Hamas official in Gaza. He accused Abbas of taking “retaliatory” action against the people of Gaza. Abbas has taken a series of measures against the territory, slashing the salaries of thousands of former government workers in Gaza and cutting fuel subsidies to pay for electricity, all in an effort to step up pressure on Hamas. These measures, combined with the decade-long blockade, have sent Gaza’s economy into freefall. The increasingly desperate Hamas has stepped up mass protests along the Israeli border in hopes of pressuring Israel to ease the blockade. Nearly 150 Palestinians have been killed by Israeli fire, yet Israel shows no signs of lifting the closure. In his address to the U.N. General Assembly last week, Abbas threatened to tighten the screws even harder, warning he could not “bear any responsibility” for Gaza if the deadlock with Hamas continues. At the same time, Israel and international donor nations were meeting on the sidelines of the assembly to discuss ways to improve conditions in Gaza. Those talks, like similar meetings in recent months, ended inconclusively. The Gaza conundrum is just the latest obstacle for the U.S. peace plan. The Palestinians cut off ties with the White House after Trump declared Jerusalem to be Israel’s capital and moved the U.S. Embassy there. The Trump administration has also cut hundreds of millions of dollars of aid to the Palestinians, including $300 million for the U.N. agency for Palestinian refugees, and shuttered the Palestinians’ diplomatic mission in Washington. Accusing the U.S. of being unfairly biased toward Israel, Abbas has already said he will not consider the American peace plan. Greenblatt acknowledged the challenge ahead at the donor meeting. Refusing to say when his plan would be released, he pleaded for all sides to consider the proposal. “Palestinians and Israelis deserve to read it, think about it, engage on it, and see if we can make it happen,” he said. Mohammed Daraghmeh in Ramallah, West Bank, and Fares Akram in Gaza City, Gaza Strip, contributed to this report.